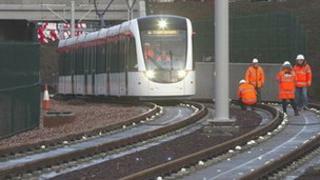 Edinburgh's tram project will be starting the most significant tests of its track and vehicles yet over the next few weeks. Overhead power lines between Edinburgh airport and the tram depot at Gogar, about 3km (1.86 miles) away, are being electrified from Monday. This means that section of line will be ready for full-scale tests. If all goes well, by March next year, it will be the first major section of the tram line to be completed. It will then be handed over to the City of Edinburgh Council. It would be the clearest sign yet that the troubled project was on track for completion in the summer of 2014. The project is massively over its initial budget and years behind schedule. The revised budget for the single 8.3 mile (13.3km) tram line, which will run from Edinburgh Airport to York Place in the city centre, is £776m.